During October - March our park fills up quickly! Please call early to make your reservations! Enjoy Southern Hospitality in Scenic Coastal Georgia! Convenient Location Near Local Seafood Restaurants! ~ We are a gated park, so please call our office upon arrival. Inland Harbor is a class A park. The managers Ron and Brenda do an excellent job managing the park and handle any issues immediately and respectfully. They have their guests in mind at all times and take very good care of each and every one of them. The park is extremely clean and safe. I live alone and never have any problems. I would recommend it to everyone. Staff friendly. Clean bathrooms. Convenient to the highway. Great overnight stop. Nice little quiet park. Great price! 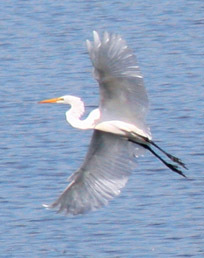 Close to I-95. No traffic noise. We would stay here again! Didn't use showers. Office staff was wonderful! Great place to stop. Make reservations it is a gated RV park. Clean and neat, all pull through sites. We stayed overnight on our way back home. Very friendly and professional staff. Very easy check-in process. Great value for the price. Shower facility was clean and well set up. Convenient to I-95. All paved roads and asphalt pads. Great facility overall. Have stayed in some rv parks that were more expensive and weren't up to the standards they have here. If you are looking for a great place to stay, this is it. "This is our first time here. What a pleasant surprise to see Brenda and Ron whom we know from Jekyll Island. This is a very nice campground - well kept, clean restrooms, quiet atmosphere and apparently, well-managed. Brenda and Ron are great hosts, welcoming, friendly and accommodating. We shall return!" 1. Very safe and friendly campground. 2. Ron & Brenda are very good at their jobs and are there for the guests 24-7. 3. Campground is well maintained. 4. Clean restrooms and laundry room as well. 5. Lots of things to do in Darien, Brunswick, ectÃ¢â‚¬Â¦.. 6. Lots of Restaurants & shopping in nearby area. 7. 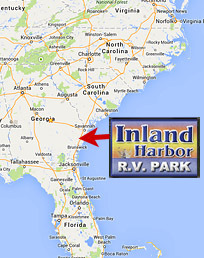 I would recommend Inland Harbor RV Park!